Thinking of attending one of the 181 colleges in Illinois? With more jobs requiring a degree than ever before and tuition rates consistently climbing, it's important that students find the perfect college. Graduation rates, tuition fees and financial aid are just a few things you need to take into account before selecting a school; you'll also want to evaluate the degree offerings and academic reputation of each college you're considering. Recent reports indicate that college graduates earn about $400 more per week than those with a high school diploma. College graduates are more satisfied with their jobs than non-degree holders, and a bachelor's degree also reduces your chances of unemployment. Furthermore, despite an expensive price tag, the higher salary college graduates earn in their first four years on the job offsets the cost of college. Simply put, a college that offers a quality education and a rich learning environment will give you a marketable degree and a chance to pursue a challenging and rewarding career. Considering that selective schools produce much higher graduation rates than non-selective schools, it's important to consider acceptance rate when evaluating colleges. While acceptance rates vary among the 115 4-year colleges in Illinois, the University of Chicago at 8.8% and Northwestern University at 15.3% are the state's most selective schools. Not coincidentally, they boast some of the highest graduation rates in the country, with 86% of students earning a degree. Our list of the best 4-year colleges in Illinois uses recent government data to analyze the most important school performance markers, including acceptance, retention, graduation and enrollment rates. These metrics indicate a university's overall quality and help us determine which schools best prepare students for their professional careers. University of Chicago, ranked as one of the best colleges in Illinois, offers undergraduate programs in a learning environment marked by free-thinking, rigorous debate, and individual empowerment. Students can choose from 49 major degrees, including interdisciplinary programs like Big Problems, which challenges students to consider solutions to global issues and concerns across disciplines. Joint bachelor’s and master’s degree programs, such as social services administration, also allow undergraduates to work toward their master of arts (MA) degree while completing their undergraduate work. Electives extend beyond class options to study abroad programs and independent research projects. Undergraduates also complete a second-language competency requirement in their first two years with the option to complete advanced training. The founding of University of Chicago in 1890 was made possible by a grant from John D. Rockefeller in collaboration with the American Baptist Education Society. With over 300 available student organizations, students have a wide range of cultural and group events in which to participate. Organizations and events include Dance Marathon, now the largest collegiate philanthropic event in the world after 12 years running, and The Midway Review, which publishes student-contributed political and cultural commentary and criticism. With 102 undergraduate degree programs from which to choose, including part-time and adjunct (joint) majors, students at Northwestern are bound to find an area of study that aligns with their interests and curiosities. Innovative programs such as cognitive science or materials science and engineering are offered alongside artistic options like voice & opera or creative writing. More than 90% of undergraduate students rank in the top 10% of their high school classes. Full-time faculty have included recipients of Tony Awards, Guggenheim, and MacArthur fellowships, as well as membership in several world-renowned professional and honorary organizations. Northwestern, one of the most renowned colleges in Illinois, features two main campuses -- one in scenic Evanston and the other in the arts-rich, downtown Streeterville Chicago neighborhood. Students on both campuses have easy access to the other through an inter-campus shuttle service and other public transportation options. Northwestern’s athletics’ scene, in addition to the always-popular football and basketball teams, includes men’s and women’s swimming and diving, women’s fencing, and men’s wrestling. UI at Urbana-Champaign offers one of the most extensive set of programs of our top-ranking Illinois colleges, with over 150 bachelor’s degrees through nine colleges and schools. A diverse set of fields yield programs like agricultural leadership and sciences education; media and cinema studies; nuclear, plasma, and radiological engineering; and many other intellectually-rich tracks. UI alumni and faculty include 23 Nobel Laureates and 25 Pulitzer Prize winners, with Reporter Glenn Howatt as the most recent recipient of a 2013 Pulitzer. UI’s strong research emphasis includes an undergraduate research week, during which accepted students’ studies are showcased in front of peers, faculty, and corporate partners. In addition, the university hosts a strong performing arts center and is home to two major museums, one in art and the other in world history and culture. Public engagement and community service are also hallmarks of the university, with over 500 service-learning courses offered and well-known public awareness campaigns like Money Smart Week, promoting financial education across age groups nationwide. Principia College, one of the highest ranking colleges in Illinois, is home to students and alumni who have, since 2009, won 87 Congressional Awards that recognize the outstanding achievements of young people. Principia takes pride in its unique student accomplishments, including its 2013 national championship-winning rugby team and first place in the 2001 Formula Sun Grand Prix by its solar car team, which regularly competes around the world. In 2015, Principia coding students also won first at the MasterCard Masters of Code competition in St. Louis, earning the team a place in the Grand Finale held annually in Silicon Valley. Students can choose from 25 majors in the arts and sciences, including an individualized major that can be designed to match student interests, with recent customized majors including film studies, range science, and music production. Students looking for a diverse but close-knit, Christian community will find one at Principia, which enrolls about 500 students from 33 states and 28 countries. Principia makes an effort to keep its tuition affordable for all students, with 40% of graduates entering the workplace debt-free. As one of the most highly-recognized Illinois colleges, University of St. Francis offers an abundance of scholarship opportunities -- a total of 88 -- for its students, including full-tuition awards for freshmen. A wide range of undergraduate degree programs include a number of pre-health tracks like dentistry, veterinary medicine, pharmacy, and several others, allowing students to prepare for more advanced study in their chosen medical field. Students have access to many other interesting tracks within a variety of arts and science domains, including music industry entrepreneurship, substance abuse counseling, and entrepreneurial and small business finance, to name just a few. With the motto “bigger thinking, brighter purpose”, St. Francis combines its liberal arts curriculum with a strong Roman-Catholic tradition. Students have the opportunity to connect with and receive guidance from peer ministers, and also to join the university ministry as a peer minister. St. Francis alumni are offered a number of lifetime benefits such as discounts on insurance, events, and travel, as well as free use of the university’s recreation center facilities and career services. IIT offers 36 undergraduate programs through its eight technical schools, including the Armour College of Engineering, the College of Architecture, and the School of Applied Technology. Exciting program options at one of the only colleges in Illinois with a tech focus include astrophysics, architectural engineering, and bioinformatics. In January, ITT hosted the 2017 FIRST Robotics Competition Chicagoland Kickoff with the Illinois Tech Robotics team, and a new associated $20,000 per year Illinois Tech/FIRST Scholarship is now available incoming freshmen who demonstrate a talent in science with entrepreneurial ambitions. ITT hosts several libraries and academic resources, some of which are also open to the public, including the Graham Resource Center for Architecture, the Center for the Study of Ethics in the Professions Library, and the Downtown Campus Library. ITT faculty and alumni have invented or helped pioneer inventions that include the cell phone, barcode technology, and tall building architecture. Located about 30 miles south of Chicago in University Park, Governors State University serves around 5,500 students annually. Degree candidates can pursue academic programs at the undergraduate, graduate, and doctoral level. Degree options include independent film and digital imaging, gender and sexuality studies, manufacturing management, and addictions studies. The university also maintains a dual degree program in partnership with several community colleges in Illinois, allowing students to easily transfer to GSU and earn their undergraduate degree faster. GSU emphasizes civic engagement, and the college's new Civic Engagement and Community Service Center offers opportunities for service learning and community service projects. The center connects students to community building activities locally and nationally. A recent service activity saw volunteers travel to Texas and assist with disaster relief after Hurricane Harvey. Illinois Wesleyan, included in our rankings of best colleges in Illinois, offers more than 80 undergraduate programs in the liberal arts and sciences. Illinois Wesleyan’s campus is situated between downtown Bloomington and uptown Normal. With an enrollment of just over 1,700 students, Wesleyan boasts a 92% retention rate, hosts 22 varsity athletic teams, and offers over 200 student organizations. New undergraduate programs include a bachelor’s in design, technology & entrepreneurship, and a bachelor’s of music in contemporary musicianship; performance; classical guitar; or string performance and pedagogy. Wesleyan’s useful Career Connector online tool allows students to explore various majors and see how alumni have applied their majors to specific professions. Almost 500 students also participated in internships in 2015. More than 80% of Wesleyan pre-med graduates are accepted to medical school after their first application, and 100% of nursing graduates find employment. Wesleyan students also benefit from four unique experiential learning opportunities: study abroad; the Eckley Summer Scholars and Artists program; hands-on opportunities through the Action Research Center; and a month-long study abroad, internship, or research opportunity during May Term. Students will find a diverse and balanced set of bachelor’s degree programs at Augustana College, located on 115 wooded acres in Rock Island, along the Mississippi River. Along with majors in the humanities and sciences, including outstanding pre-professional programs in the health fields, Augustana is one of the only Illinois colleges to offer a minor in Japanese and other uncommon programs such as Scandinavian studies, entrepreneurial studies, and entertainment and media industries. Augustana’s residential campus provides many opportunities outside class, including nearly 200 students groups including 27 club sports and 22 music ensembles. All students may apply for Augie Choice, a $2,000 stipend towards a research project, study abroad or internship. With an average class size of 18, a 12-to-1 student-faculty ratio and side-by-side career coaching in CORE (Careers, Opportunities, Research and Exploration), Augustana students benefit from close relationships with mentors throughout all four years. About 97% of Augustana graduates are employed, in graduate school or in service positions such as the Peace Corps within six months after graduation. UIC’s selection of 86 undergraduate degree programs offers something for everyone, with options in the arts, life sciences, education, architecture, urban and public affairs, and more. New degree options from one of the top-ranked colleges in Illinois include a BA in integrated design and arts, a BS in integrated health studies, and joint bachelor’s and master’s options in urban studies/urban planning and policy, and public policy/public administration. Programs are continually revised to allow for new content integration based on new technologies and theories in the field. UIC hosts a large and diverse study body, with over 16,000 undergraduates from around the world on its 240-acre “green” campus. The university’s seven Centers for Cultural Understanding and Social Change (CCUSC) reflect and represent the school’s diversity and include a Gender and Sexuality Center and a Women’s Leadership and Resource Center. UIC also makes a point to provide students with entertainment in a safe environment, and each fall, UIC’s freshmen attend Spark in the Park, a musical festival featuring performances by well-known artists. Among many other student facilities, the Sports & Fitness Center offers swimming lessons and a 43-foot rock-climbing wall. Located in Bloomington-Normal at the state’s center is Illinois State University, one of the best colleges in Illinois offering an extensive set of undergraduate majors in a wide range of disciplines, from information technology to agriculture to finance. Students can opt for cutting-edge degree programs like web application development or interactive media; unique arts-based domains such as music therapy or theater design and production; or scientific avenues like crop and soil science or engineering physics. Many of Illinois State’s departments and academic organizations have an active social media presence on Twitter, Facebook, Snapchat, and other apps, allowing students to connect and interact from anywhere. Illinois State is also recognized as a first-rate place to work by The Chronicle of Higher Education. The campus invites students to be involved at all levels; for example, dining & hospitality students recently formed a Vegetarian Advisory Council in response to students’ dietary values and preferences. One of the best colleges in Illinois, Wheaton College offers dozens of undergraduate degree programs in the arts and sciences, pre-professional programs like pre-law and pre-med, and degrees through the reputable Conservatory of Music. Curriculum is taught with a Christ-centered worldview, and several programs like Biblical archeology and ancient languages allow students to study their faith in depth. The Wheaton College Science Station, located in South Dakota’s Black Hills and part of the college’s Global and Experiential Learning studies, is the longest-running off-campus facility of its kind. Students have the opportunity to travel and take courses at the station in natural science, biology, geology, and environmental science. On-campus worship and spiritual-life networking through organizations and events are an important staple of campus life. A number of active outreach institutes, such as the Humanitarian Disaster Institute and the Institute for Prison Ministries, also invite student participation and highlight the college’s emphasis on the study and application of faith amidst human struggle. Eastern Illinois offers an extensive range of undergraduate major programs across the arts and sciences, including innovative majors like applied engineering & technology or health promotion and minors in neuroscience or environmental sustainability. High-performing students may also qualify for entrance into the Pine Honors College, which offers small and engaging honors classes, special scholarship and extracurricular opportunities, priority registration, and other perks and benefits. New EIU students have the option to participate in the Prowl orientation program, with social and academic activities for incoming freshmen like the “Just Say Hi” campaign and the Run for a Reason event. As one of the best Illinois colleges, EIU is a National Student Exchange (NSE) member school, allowing students the opportunity to study, participate in internships, and partake in other field experiences at institutions abroad. EIU’s student recreation center features an eight-mile jogging track, free-weight gym, dance studio, indoor basketball and volleyball courts, and much more. EIU is a leader in undergraduate research opportunities and has been recognized as one of 29 public institutions with high student participation by the national Council on Undergraduate Research. Knox College offers an extensive list of bachelor’s degree options and pre-professional programs, as well as the opportunity to create a self-designed major. In addition to options in medicine and law, pre-professional programs offered include environmental management, architecture, engineering, and business. Over 90% of pre-law Knox students are accepted into law school and about 80% are accepted into medical school. Knox College’s Seymour Library houses the Umbeck Science and Mathematics Center, providing students with access to a variety of special digital and print resources. Hailing from one of the best colleges in Illinois, recent Knox alumni have gone on to secure jobs in companies and organizations like IBM, Boeing, Teach for America, and the New Orleans Museum of Art. The Knox Alumni Mentoring Program (KAMP) offers students the unique opportunity to network with successful alumni in a field or profession that aligns with their career objectives. UIS offers a variety of undergraduate degrees in the liberal arts and social and life sciences through four colleges, including public policy, visual arts, and biochemistry. The unique astronomy/physics program is a thematic degree that explores current issues through conferences, real-world learning experiences, and multidisciplinary courses. Other popular undergraduate programs include business administration, computer science, and psychology. The university works to keep its tuition rates affordable, recently implementing a tuition freeze for a third straight year. The university’s NCAA Division II-ranked athletics teams include men’s and women’s tennis, soccer, and track and field, to name a few. Not only is UIS one of the best colleges in Illinois, but it also shares a home base with the site of Abraham Lincoln’s national historic home. UIS is also home to the innovative Illinois Innocence Project, a collaboration between UIS faculty, students, and attorneys work to review and evaluate cases of wrongful imprisonment and raise public awareness nationwide through events and multimedia avenues. Established as a nursing school in 1900, Methodist College has evolved into one of the top health care schools in Illinois, offering programs in health care administration, health science, social work, nursing, and nursing education. The university also offers professional certificate programs in gerontology, medical assistant, and nursing assistant. Methodist's Simulation Center and Clinical Practice Center are a major part of the educational process for most students. This learning facility offers hands-on technology simulations that mimic nursing and health care practices, which allows students to gain clinical experience in a controlled, supervised environment. Simulation activities offer hands-on experiences and theoretical coursework. Along with required clinical sessions for various classes, students can also sign up for group-directed practices that build additional experience. Most clinical sessions are recorded, allowing participants to debrief and analyze their implementation of health care practices. IC students will find an extensive variety of undergraduate programs, from pre-dentistry to physics to creative writing, at the first higher institution in the state to offer a bachelor’s degree. Experiential learning is valued and integrated into course curriculum, with students exposed to real-world simulations and direct career preparation in the classroom. IC offers a variety of internship, leadership, research, study abroad, and service opportunities, and it’s one of a handful of Illinois colleges to offer students the opportunity to apply for experiential funding for first-time experiences. In addition to an advisor, all students are assigned a first-year seminar teacher, who gets to better know a student’s objectives and strengths and can provide further advice on potential academic and extracurricular directions. IC offers an 11:1 student-to-faculty ratio and more personalized experiences in the classroom. Early campus visitors and lecturers included Ralph Waldo Emerson, Abraham Lincoln, and Mark Twain, among other renowned figures. More than 60 undergraduate major options at Elmhurst College open doors at one of the top Illinois colleges for unique arts and science career paths in areas like computer game and entertainment technology or geographic information systems (GIS). Students can also choose from a number of pre-professional programs, including library science, medicine, law, and many more. More than 80% of Elmhurst students participate in internships and field experiences, with 93% of students finding full-time employment or gaining admittance to graduate school within a year after graduation. Elmhurst is a private college in a quiet suburban Chicago neighborhood, just a 30-minute train ride from downtown Chicago. The college’s “Old Clock Tower” in its old main campus features signatures of students and faculty dating back to 1899; today, student leaders and others are invited to climb the steps of the historic tower and leave their mark on the campus’ history. Elmhurst offers special programs to its diverse student body, including Direct Connect, which helps equip first-generation college students with the resources that they need for success. Bradley offers one of the largest set of degree paths among our top-ranked Illinois Colleges, with options in the arts, science, and pre-professional fields. Cutting-edge bachelor’s degree options include social media marketing, television arts, manufacturing engineering technology, computer science game technology, and more. An Academic Exploration track is also available for students who are undecided on a career and want to explore their options during their first two years as an undergraduate. The Lewis J. Burger Center for Student Leadership and Public Service provides a number of student leadership and service opportunities, including the selective leadership & public service fellows program, which admits 15 freshmen each year. An annual center retreat is also offered to all students interested in improving their leadership skills and meeting other like-minded students. Campus bus services are offered to students traveling to the Chicago airport, located about three hours northeast of the campus, while local Peoria International Airport offers several convenient direct flights in and out of major airports in the South and Midwest. The Chicago suburb of Naperville is home to North Central College, a United Methodist-affiliated liberal arts college with an annual enrollment of about 3,000. Founded in 1861, the school holds a long history of progressivism. Inaugural college president A.A. Smith was a devoted abolitionist, and North Central was among the first schools in Illinois to enroll women students. Today, the college is known for its commitment to undergraduate teaching, offering dozens of bachelor's degrees in unique subjects, including bioinformatics, film and screen studies, forensics, jazz studies, and sports management. Graduate programs include education, liberal studies, business administration, leadership studies, nonprofit management, and occupational therapy. About 40% of degree candidates at North Central are first-generation college students. The school's Cardinal First program offers a variety of support services, including academic resources, mentoring, and networking opportunities. Dominican University, recognized as one of the top ranking colleges in Illinois, offers more than 50 liberal arts-based degrees in the arts and sciences and seven professional and pre-professional programs. Dominican places a high value on student engagement and participation and encourages students to pursue one or more opportunities in community-based service, internships, a choice of 20 study abroad programs, or research projects through its Undergraduate Research, Scholarship, and Creative Investigations (URSCI) program. The university was founded according to Catholic Dominican values and operates in the spirit of the “Dominican ethos”, which includes thinking about the meaning of existence and an individual’s role in working towards a more humane and just world. High-performing students may benefit from the Mazzuchelli Scholars Honors Program, which offers unique opportunities to work one-on-one with experts in the field, eligibility for high-ranking scholarships, and other benefits. Dominican’s suburban River Forest campus is located just 10 miles outside of downtown Chicago, where several off-site classes are also offered. Lewis is a Catholic institution sponsored by the De La Salle Christian Brothers and one of the best colleges in Illinois. The university offers a diverse set of on-campus undergraduate programs through its four liberal arts colleges, including a number of dual-degree and combined bachelor’s and master’s options. Students can choose unique medical degree options such as radiography or diagnostic medical sonography, or pursue a number of program options in aviation or education. With more than 6,500 local and international students, Lewis welcomes students from all cultures and belief systems. Lewis’ Multicultural Student Services Centers hosts an annual Fulfilling the Dream conference, a tribute to Martin Luther King, Jr. and an initiative meant to encourage and provide resources to African American high school students who want to pursue a post-secondary education. Students can join a number of student-led media organizations, including the university radio station and The Jet Fuel Review literary journal, along with a number of other academic and cultural groups. Ranked as one of the top public colleges in Illinois, Western Illinois University serves around 10,000 students from a residential campus in Macomb and a non-residential campus in the Quad Cities/Moline. WIU offers dozens of graduate and undergraduate degrees, including unique bachelor's programs in agriculture, apparel and textile merchandising, meteorology, and forensic chemistry. Some of WIU's graduate programs include kinesiology, theater, health sciences, and educational leadership. The university highlights several signature programs, which are noted for their size, uniqueness, or accessibility. This includes programs in sports broadcasting, musical theater, supply chain management, and recreation and tourism administration. WIU is home to an active campus community that includes several NCAA Division I sports teams, intramural teams, club sports, and more than 250 campus clubs and organizations. Campus students also benefit from dedicated academic advising services, which can assist with course and major selections, alternative admissions, changing majors, and career counseling. LCU’s undergraduate degrees combine professional studies with opportunities for spiritual growth at one of the most highly-ranked colleges in Illinois. Each of Lincoln’s 12 bachelor degree programs -- including intercultural studies, youth and family ministry, and business administration -- integrates a Christ-centered curriculum with research and leading theories in the field. The university’s James. D Strauss Institute features an annual lecture with a biblical worldview lens, and also offers proactive initiatives like Room for Doubt, providing resources for young adults who have doubts in their faith and are seeking experiences that renew their beliefs. LCU enrolls a small student body of almost 1,000 students, with a 14:1 student-to-faculty ratio offering increased opportunities to form personal relationships with professors. LCU’s athletics rank in the NCCAA Division I and include six men’s and women’s varsity teams, including soccer and basketball. Student activities cover a variety of interests and include FOCUS, a weekly student-led worship session; intramural sports; and LCU Sings Out, a singing event styled after American Idol that includes a panel of faculty judges. Trinity Christian College was founded in 1956 to bring Christian education to the Chicago area. Trinity focuses on liberal arts education, but also offers programs in science, business, education, and social science. Students may choose from more than 80 programs, including chemistry, music, physical education, criminal justice, and world languages. Graduate students may earn a degree in counseling psychology or special education. The school also hosts several programs designed for adult learners, with courses held from 6 to 10 pm once per week. Trinity boasts an active campus with student ministry, intercollegiate sports, student publications, and clubs. Since the campus is only 30 minutes from Chicago, students have access to internships, events, and museums. The school provides a job board and helps students find placements after graduation. Trinity offers semester abroad programs and interim trips to Jamaica, Italy, South Africa, France, and other countries. Freshman applicants must have a minimum 2.5 GPA and acceptable ACT scores. Illinois' community college system is the third largest of its kind in the world; more students enroll in it than any other higher education sector in Illinois. Whether you want to attend a two-year college in preparation for a four-year program or to attain an associate degree or certificate, you'll have 66 schools to choose from. With tuition ranging from $2,272 to $4,035, community colleges are about 75% cheaper than other four-year programs in Illinois. They offer affordable schooling while opening doors to further education to a range of students from various backgrounds. Although graduation rates at community colleges are comparatively low, students who earn their degree benefit financially. A recent report indicates that graduates from Illinois' community colleges received an average full-time salary of $36,420 in their first year out of school. 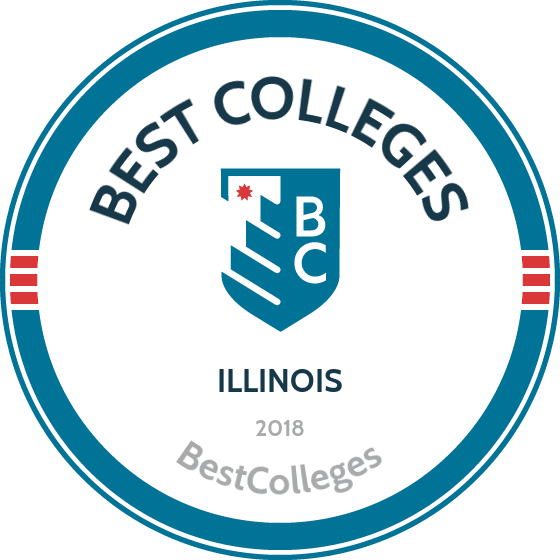 To ensure you're setting yourself up for success and investing in a quality education, browse our list of the best 2-year colleges in Illinois. Developed in accordance with our unique methodology, our rankings can help you find the right program for your academic and professional interests. FCC is one of four two year colleges in Illinois that is part of the Illinois Eastern Community Colleges network. The school offers a number of two-year programs that prepare graduates to directly enter a career of their choice. associate degree options range from professional degrees like executive office professional or graphic arts and design, to hands-on programs such as automotive technology or construction technology. The college has maintained accreditation from the Higher Education of the North Central Association of Colleges and Schools since 1982. FCC enrolls about 2,200 students each year, with a majority of students age 17 or younger, with a second-largest demographic group between the ages of 45 and 55. The college maintains an active social media presence, including a Facebook page and YouTube channel, allowing students to keep up with FCC Bobcats Athletics or other campus events. Wabash Valley College is one of four Illinois community colleges that is part of the Illinois Eastern Community College (IECC) network, offering an array of certificates and degrees in areas ranging from agriculture to nursing. Students interested in mechanics might choose the diesel equipment technology degree, while those with career goals in media may find the radio/television broadcasting degree to be a great fit. WVC operates under IECC’s values of responsibility, honor, fairness, self-respect, and compassion. On-campus students will find a variety of convenient services, including the WVC Red Café, a fitness center with swimming pool, and a licensed child-care facility for children from birth through age eight. In addition, a robust performing arts scene offers a number of shows and events to the public, including cultural festivals, musicals, radio shows, and more. At Elgin, one of the best community colleges in Illinois, students can choose from a number of associate degrees in the arts and sciences, engineering, fine arts or liberal studies. The Elgin Community College Honors Program offers motivated and high-performing students smaller class sizes, experiential learning opportunities experiences, exclusive scholarships, and a free course for every honors course completed. All students also have the option of completing their degree through a learning community, a cohort of students that take two or more courses together and serve as a social and academic support network. About three out of ten local high-school students decide to attend ECC and complete an associate degree and/or transfer to a four-year institution. Of the more than 16,000 students enrolled, about 40% identify as Hispanic, while another 16% from other minority groups. First founded in 1949, ECC has opened doors to several state-of-the-art buildings and facilities in the last seven years, including the Renner Academic Library and the college’s new health and life sciences building. In addition to ranking as one of the best community colleges in Illinois, Olney Central College is a member of the Illinois Eastern Community Colleges, offering associate degree programs in fields that target a diverse set of interests, such as administration of justice, nursing, industrial maintenance technology, and collision repair. Most programs offer a significant set of general education courses that are transferrable to four-year universities. OCC also offers a large number of transfer degree programs, including pre-professional options like veterinary medicine and pharmacy, that prepare students for entrance into a competitive four-year program. Students can also choose from several business and medical office related degrees and certificates. Career services offer students assistance in finding internships as well as part-time work while enrolled at OCC. OCC enrolls about 1,400 students annually, with most students between the ages of 18 and 24. The college promotes participation in its men’s and women’s athletic teams, theater arts program, or diverse range of other academic and cultural clubs and organizations. Oakton Community College offers more than 80 degree and certificate programs in business, the arts, and the sciences. OCC has particularly diverse offerings in computer business applications and information systems, and offers a list of certificates that can be taken in addition to earning an Associate of Applied Science in the field. Other unique areas of study from one of the leading two year colleges in Illinois include mechanical design, substance abuse counseling, and health information technology. Students who earn at least a 3.5 GPA and meet other qualifications can apply for acceptance into OCC’s Honors Program, which offers more challenging classes and interdisciplinary seminars. A variety of student clubs and organizations encourage community involvement and include Student Government, volunteer groups like Habitat for Humanity, and a student-run newspaper. Oakton has main campuses in the Chicago suburbs of Des Plaines and Skokie, and maintains another 240 off-campus locations throughout the state. Rend Lake offers more than 100 two-year degrees and certificates to accommodate a diverse set of career interests, from truck driver training to culinary arts to pre-law. Complementary certificates can be completed in 6 to 48 weeks, depending on area of expertise. In addition to offering low tuition rates and scholarship opportunities, Rend Lake provides additional cost savings through its textbook rental program, one of the only community colleges in Illinois to offer such a program. Students interested in starting their college career early can apply for dual credit and enrollment while still attending high school. Rend Lake hosts a variety of community events, including Comedy Improv shows, craft and fitness classes, even a winter Homecoming. Rend Lake is a member of several “green” associations, including Sustainability Education and Economic Development (SEED). The college’s Sustainability Center promotes and educates students on green practices and implements initiatives like recycling campus-wide. College of Lake County enrolls over 8,000 full-time students at its Grayslake, Illinois campus. A tobacco-free campus since 2015, CLC is one of several two year colleges in Illinois to earn this designation. Students can choose from a wide array of career degrees and certificates or transfer degree programs in fields like arts and communication, manufacturing technologies, or health sciences. Transfer pathways programs are also available to students who wish to explore general studies before committing to a major. Students may also consider co-op education or service learning options, offering college credit for work experiences or hands-on experience through community service opportunities. CLC is accredited by the Higher Learning Commission under its Academic Quality Improvement Program, which involves completing an annual action project to continually improve standards and facilities. CLC was one of nine colleges to receive a 2016 Green Genome Award for its efforts in integrating sustainable practices into its facilities, curriculum, and campus-wide initiatives. Lewis and Clark Community College, a two-year school with multiple campuses in the state, serves learners by offering more than 40 career options and several transfer degrees. The college, located in Godfrey, enrolls approximately 15,000 students. Learners can pursue associate degrees in fields such as nursing, accounting, engineering science, criminal justice, paralegal, and health information and medical coding. Students interested in technical and trade careers may earn the associate in applied science in welding technology, architectural technology, process operations technology, or computer graphics. The school's unique AAS in restoration ecology prepares learners to repair habitats, analyze ecosystems, and foster sustainable environments. LC, one of the top community colleges in Illinois, offers a wide range of certificate programs in areas such as machining, new media technologies, truck driver training, and smart grid technology. Students may transfer associate degrees to one of LC’s four-year partner colleges. Sauk Valley Community College offers 21 career and 43 transfer associate-level degrees across domains in STEM, health, the arts and sciences, education, and manufacturing. Career-oriented degrees, such as the multicraft technology major in the manufacturing degree program, offer academic study alongside hands-on job training. Many other programs offer both a career or transfer degree program of study. An annual Transfer Week includes workshops and resources for students looking to transition into a four-year institution. The Academy at SVCC, one of the best among two year colleges in Illinois, also offers high-performing high-school seniors the opportunity to engage in and earn credit for college-level coursework. Sauk has an open-enrollment policy and encourages students of all ages and at various stages in their academic or careers to apply. A variety of student support services, including a first-year orientation and Student Success Workshops, are offered to new students. Sauk can help connect students with a number of local services, from daycare facilities to food pantries to public transportation. Lincoln Trail College, also part of the Illinois Eastern Community College community, provides a number of hands-on degrees in fields such as nursing, horticulture, and corrections. Two-year transfer degree programs and a variety of professional certificates are also available in a range of other subjects. An associate degree in General Studies is also available to students who wish to explore their career interests before committing to a specific field. Students usually apply for admission about a month before the start of a new term, though late registration is available. Compared to many other Illinois community colleges, LTC offers a wider variety of men’s and women’s athletics teams, including golf, volleyball, and cheer team. An active social media presence on Facebook, YouTube, and Twitter allows students to stay connected on and off campus. The LTC Theater has put on productions for over 40 years, and a strong music program offers opportunities in jazz band, a concert choir, and more. Students at Moraine Valley Community College can choose from an array of stand-alone associate degrees or transfer degree programs in the arts, education, business, and social and life sciences. Those interested in a career immediately after graduation might choose a program in digital art and design or IT security, while students looking to continue their studies at a four-year institution might opt for one of several pre-professional or education degrees. High-school students interested in getting an early start on their post-secondary education can also apply for dual credit or enrollment at one of the top two year colleges in Illinois. Moraine Valley supports and encourages student engagement on campus, with opportunities to participate on athletic teams that compete in the National Junior College Athletic Association and the Illinois Skyway Collegiate Conference. A variety of clubs and organizations meet a diverse range of other interests, from Ultimate Frisbee to the Muslim Student Association. Moraine Valley identifies as a sustainable campus and works to integrate “green” practices and education into its curriculum and campus activities. Harper College offers two-year associate degrees and professional certificates in a wide range of domains, including architecture and construction, information technology, and law enforcement. Some degrees are designed to lead to direct entry into a field, while others--like the associate in applied science in interior design--are structured as transfer degrees in partnership with Illinois four-year institutions. Each of Harper’s degree program pages offer a link to a visual “career path” map, a helpful tool when choosing and planning an academic course of study. Located in the northwestern Chicago suburb of Palatine, Illinois, Harper has offered its degree programs since 1967 and now serves over 40,000 students at one of the best community colleges in Illinois. A full two-year tuition Promise Scholarship is offered to new students who meet requirements that include a record of good attendance and participation in community service. McHenry County college offers a versatile Associate in Arts degree, designed to provide the first two years of requirements for continued completion of a four-year bachelor’s degree at another Illinois higher-education institution. All AA degrees meet the Illinois Articulation Initiative General Education Core Curriculum (IAI GECC), a set of general education requirements that are transferrable to participating IAI schools. Students work closely with an advisor to design an AA program that aligns with their continued academic and career interests in the humanities, fine arts, social and behavioral sciences, physical and life sciences, or mathematics. All degrees require a total of 60 credits for program completion. Like many Illinois community colleges, McHenry is committed to student success and provides a number of free services, including tutoring, career and veterans services, technology resources, and more. Students can also apply for a number of school-funded academic or cultural scholarships, as well as participate in service learning and internship opportunities. With more than 50 degree and certificate programs, Carl Sandburg College has a wide array of options for students, whether they're enrolled in a technical program or plan to transfer to a four-year college or university. Sandburg has two locations -- a Main Campus in Galesburg and a Branch Campus in Carthage -- and offers several online courses, including an Associate in Arts degree that can be completed solely through online classes. The college is also the only satellite location for the National Academy of Railroad Sciences (NARS). Emphasizing connectivity in the classroom, Sandburg was named the national champion for digital technology among colleges its size. It marked the fifth time the college has received the honor and the ninth straight time it's placed in the top 10 in its class. The college fields 10 intercollegiate athletic teams through the NJCAA in addition to offering talent scholarships for creative writing, music, theater, art and journalism. Waubonsee Community College (WCC) offers its students more than 150 scholarship options annually. A selection of associate degrees in WCC’s career education programs prepare students for immediate employment after graduation, and include options in communication and the arts, business, health and public service, education, and social and life sciences. A wide variety of transfer programs, which culminate in an associate in science or arts, prepare students to enter a four-year institutions post graduation. Three specialty transfer degree programs are also offered in engineering, art, or music performance. WCC offers its student community a comprehensive set of health and wellness services, including a fitness center and access to personal counseling. The college’s 13 team sports, variety of student organizations, and leadership program round out opportunities to get involved at one of the most active community colleges in Illinois. WCC also features a Business Etiquette Series throughout the year that offers free monthly events, including “Netiquette” and Resumés and Interviews. C​ity Colleges of Chicago, the largest community college system in the state, enrolls approximately 80,000 students through seven colleges and satellite sites across the city. The Richard J. Daley campus offers a wide range of associate degrees in various fields. Students pursuing traditional occupations may earn associate degrees in education, business economics, management, paralegal, networking systems, and web development. CCC, one of the top community colleges in Illinois, features a comprehensive range of programs in the skilled trades. Students may obtain an associate degree in fields such as manufacturing technology, CAD technology, automotive technology, and transportation and logistics. Students may also pursue one of the health care programs in nursing, community healthcare, dental hygiene, occupational therapy, and mortuary science. The associate in applied science in gerontology prepares workers for careers assisting the elderly. One of the school's unique transfer programs, a pre-aviation pathway, gives students foundational knowledge for careers in the military, the airline industry, or aerospace technology. As one of the best community colleges in Illinois, Morton College’s programs are accredited by the Higher Learning Commission and include both career and transfer degree options. Students can pursue careers and academic interests from a long list of programs in the arts and sciences, fine arts, or early childhood education. A personalized degree in liberal studies is also available as a transfer program. Culminating two-year career degrees, designed for students who want to enter the workforce, include innovative options such as fire science technology and computer aided design in architecture. MC is the second longest-running community college in Illinois and serves a number of communities in the western-portion of the state. The college is home to the Institute for Cold Case Solution, founded in 2004 and staffed by researchers including present and former MC students. Researchers analyze “old and cold” criminal cases through cutting-edge research practices and collaboration with local law enforcement. MCC also offers plots to students and community members in its on-campus community garden. As one of the leading two year colleges in Illinois, John A Logan College provides associate degrees in the arts, teaching, engineering, and science domains. All associate degree programs are designed to meet general requirements for the first two years of a four-year bachelor’s degree program. Many of the associate in science degree programs require further state licensure or capstone requirements, and some--including pre-med options in chiropractic and pharmacy--are structured as a “package program” with a specified four-year institution. As a recognized military-friendly university, JALC offers its veterans a resource office that is staffed by other veteran students and faculty. The campus is the site of the Harrison/Bruce Historical Village, which includes an old storefront, house, and cabin reflecting the area’s local history and open to the public for tours and events. Located in Harrisburg, Southeastern Illinois College offers approximately 80 associate degree and certification programs in academic fields and trade skills. The school boasts the sixth-highest degree completion rate in the state. SIC's suite of programs include associate degrees that are designed for transfer to four-year colleges. Program offerings include nursing, criminal justice, liberal studies, and business management. Students interested in skilled trades and technical fields can earn two-year associate in applied science degrees. Notable fields of study include coal mining technology, diesel technology, veterinary technology, welding technology, and biofuels production and sustainability. SIC is one of the top community colleges in Illinois because of its pre-professional programs, which includes dental, nursing, medicine optometry, and veterinary science. Students seeking certifications have several options, including personal trainer, truck driving, information technology, and fire and mine rescue safety. Other notable programs include fashion design, sports media, and forestry. Danville Area Community College adapts its programs to respond to the changing economic needs of the region. The school boasts a faculty with four national teaching excellence awards earned within the last six years. DACC offers more than 100 transfer and career programs that are administered through three academic divisions. The school's partnerships allow students to begin their education at DACC and transfer to a four-year college. Learners may obtain transfer degrees in a wide range of disciplines, including business, communication, computer science, engineering, and healthcare. DACC also offers programs in agriculture, business, education, information systems, and public safety. DACC, one of the top technical schools in Illinois, offers skills-based associate degrees designed for entry-level careers in industry. Options include advanced manufacturing, electronic technology, manufacturing engineering technology, and wind energy technician. Learners may earn professional certification from DACC in a matter of weeks. South Suburban College’s Honors Program offers enriched study to qualifying students, along with tuition waivers for Honors courses and special assistance in applying to academic scholarships. SSC students can choose from a variety of associate degree or transfer curriculum programs in the humanities and communications, design and engineering, life sciences, nursing, construction and industrial technology, and more. Program courses are continually updated to include the latest knowledge and technological advancements in particular fields. An associate degree of liberal arts curriculum is also available, with transfer credits, to students who are interested in waiting to choose a major until they enroll at a four-year institution. SSC’s modern performing arts center is one of the best among community colleges in Illinois and sponsors a selection of public events, including plays, stand-up comedy, lectures, and concerts. A variety of business workshops and events are also held throughout the year at the college’s Business & Career Institute. Students planning to transfer to a four-year institution can enroll in one of Illinois Valley Community College’s associate degree programs in the arts, sciences, or engineering. Those looking to launch their career immediately after graduation can choose from one of several associate in applied science degrees. IVCC offers a number of unique programs not available at other two year colleges in Illinois, including fashion merchandising and geography/meteorology. Applied science degrees are available in business and finance, information technology, education, medicine, engineering, and several more in-demand career fields. IVCC offers a number of academic, cultural, and athletic groups and organizations, including a performing arts and music organization, Hispanic leadership team, and Gay/Straight Alliance group. Reputable IVCC alumni include Marion Dane Bauer, an award-winning children’s author; James Blass, who leads global innovation for the Caterpillar Corporation; and Don Baker, mayor of Peru, Illinois for over 40 years. Founded in 1966, Lake Land College serves learners in the east-central region of Illinois. The school accommodates students who want to transfer to a senior college and students seeking immediate employment. Students may pursue transfer degrees in fields such as business, economics, mathematics, conservation, and engineering science. Learners interested in becoming teachers can earn an associate degree in mathematics education, physical education, secondary education, or health education. LLC, one of the top schools in Illinois for career preparation, teaches students foundational skills. Students seeking immediate employment can complete associate programs in fields such as automotive technology, civil engineering technology, fire science, and human services. The school also offers associate degrees in dental hygiene, nursing, physical therapy, and medical assistant. Students who do not want to enroll in a degree program may earn certificates in a wide range of fields. Learners may also complete their GED. Kaskaskia College, a comprehensive two-year college located in Centralia, offers more than 50 associate degrees that prepare students for employment and higher education. The school's associate in arts and associate in science degrees prepare learners for transfer to senior colleges. AA and AS programs include business, communication, computer science, elementary education, paralegal studies, physics, and social work. As one of the top community colleges in Illinois, the school also offers pre-professional programs in dentistry, medicine, pharmacy, and veterinary medicine. Professionally-focused students may pursue associate degrees in accounting; horticulture; respiratory therapy; carpentry occupations; and heating, ventilation and air conditioning. Learners may also enroll in one of 102 certificate programs. Certificate options include automotive technology, emergency medical technician, radiography, culinary management, library assistant, and retail security. Black Hawk College offers career preparation and transfer programs through its campuses in Moline and Kewanee and its outreach sites. The school serves more students in the Quad-Cities area than any other college. Students can earn associate degrees in fields such as business, nursing, legal office professional, agribusiness management, and health information management. The school also offers an AAS in computer technology with three tracks: application developer, IT support technician, and network administration. Students seeking to transfer into a baccalaureate program usually enroll in BHC's associate of arts or associate in science programs. BHC maintains articulation agreements with several in-state and out-of-state schools, including Illinois State University, the University of Illinois, and the University of Iowa. Students seeking employment can gain practical skills through the industrial training lab. The school also operates an adult learning center and a community education center. If you're thinking about applying to one of the best colleges in Illinois, continuing reading to learn more about living in the Prairie State. Illinois boasts the 5th largest population in the United States, most of it concentrated in the Chicago metropolitan area in the northeast part of the state. Picturesque prairies characterize central Illinois and large rivers flow through the state's southern farmlands. Chicago is home to 2,695,598 people, making it the third largest city in the country, behind New York and Los Angeles. Widely considered a microcosm of America, there's plenty to see and do in Chicago, from boating on Lake Michigan to eating Chicago dogs amidst the city's incredible architecture. Residents and tourists alike enjoy exploring museums and attending award-winning plays or live jazz in the city's famous theaters and clubs. The hustle and bustle of the big city couldn't be further away from the quiet solitude you'll find in the rest of the state. In central Illinois, you can visit the only home Abraham Lincoln ever owned while exploring wineries, breweries, zoos and museums as you head south. Southern Illinois is rich with farmland and wildlife. Orchards, berry farms and pepper farms dot the landscape, offering "u-pick" seasonal agritourism. The 286,400 acre Shawnee National Forest lines the southernmost tip of the state, along with the Mississippi River, Ohio River and Illinois Ozarks. When attending college in Illinois, residency offers a variety of benefits, from cheaper in-state tuition to better scholarships and financial aid opportunities. While residency requirements depend on a student's age and the duration of their residency, other regulations vary from school to school. Below, you'll find data reflecting residency requirements established by the Illinois Student Assistance Commission. The requirements pertain to their administered programs, which include the Monetary Award Program, State Scholar Program and other gift assistance programs available for prospective students. For minors applying to an Illinois college, residency will depend on where their parents live. At least one parent must reside in the state and Illinois must be their permanent home. Adults will be considered a resident of Illinois after living in the state for at least 12 consecutive months immediately before the academic year they are applying for.